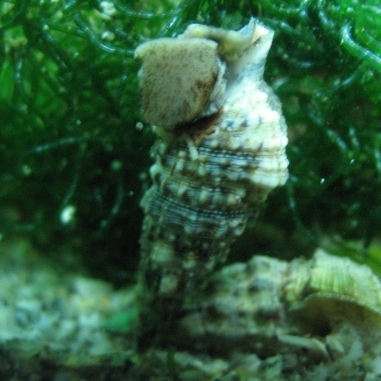 Florida Cerith snails range in size from an inch to 2''. These snails will consume diatoms, detritus, cyano, film and hair algae in the substrate especially and will work on the rocks, and sometimes on the glass in your aquarium. Because of their versatility and hardiness, they are one of our favorite cleaners, and we find them to be excellent cleaners. They are only fair at removing hair algae though. They will not eat through decorative algae or seagrasses. They take time to "come out of their shells" and move about after placing them in your tank. Please give them at least 72 hours to start moving about. It is abnormal for them to move around right away. Additionally, when the snail is pulled into its shell, the opperculum can pull back around the corner of the circular opening. The shells are not empty, that is just how this species is. If you are uncomfortable with this, try our dwarf ceriths. We strongly recommend that orders over 25 Florida Ceriths be shipped via Express Mail. Quantities greater than 25 are not covered by alive arrival guarantee.